Decision making plays a fundamental role in both our business and personal lives. At work, it is a key component of problem solving which is a challenge that is constantly faced. 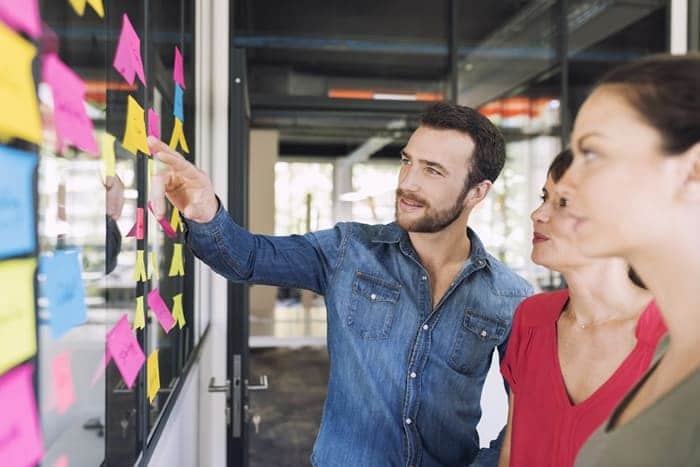 Those employees that are able to master the skill of making decisions are the very people who take the business forward and, in doing so, develop their own career. Making decisions and solving issues is made much easier when we have a set of tools and processes at our disposal. These training course materials aim to give your participants the skills that will help them to understand decisions, define problems, evaluate options and make the best choices. Perhaps you’re looking to ensure your team are better able to make effective decisions that get results. Or you want to include decision making skills training as part of management and supervisor development. Whatever your need, Trainer Bubble provides you with a comprehensive decision making training course to make your life easy. 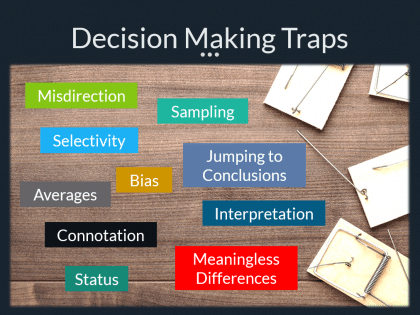 Why is running this decision making course a good idea? Understand and evaluate the decision to be made and the potential outcomes. 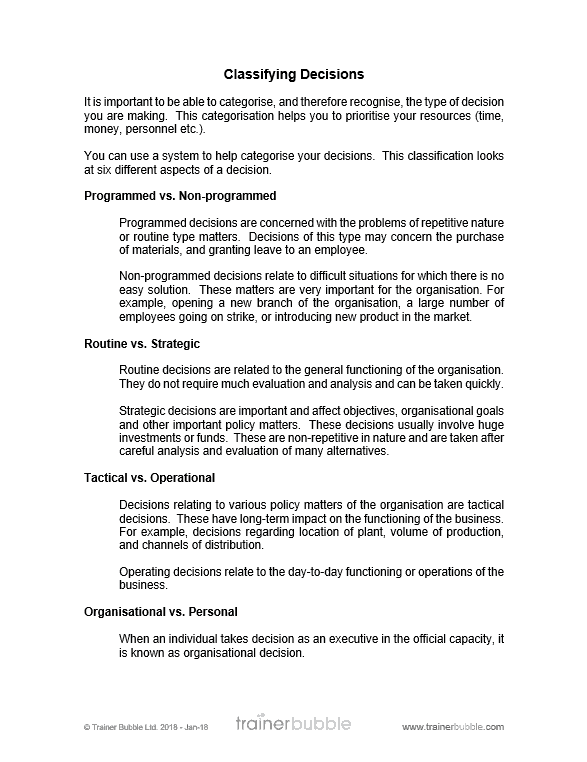 Classify the decision and what the important factors are. Follow a consistent, logical process for decision making that establishes the best decision every time. Structure their approach to making decisions. Evaluate options against set criteria and avoid typical decision making traps. 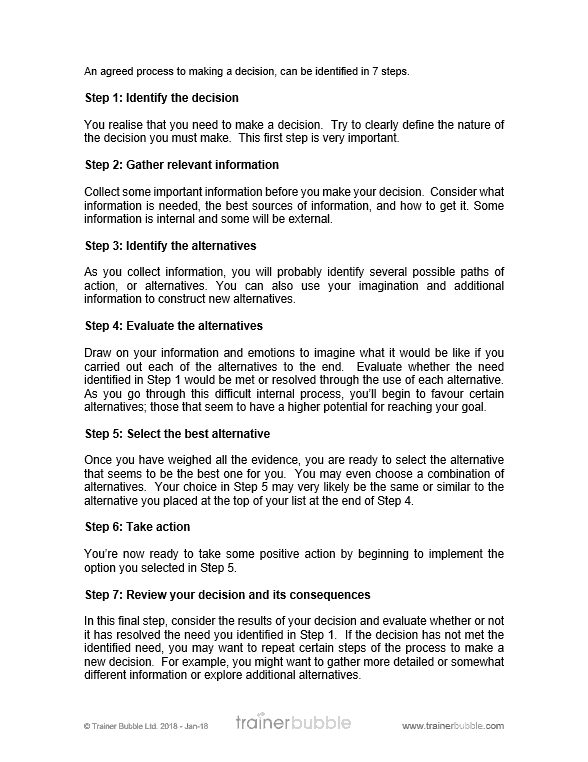 Follow-up on chosen decisions to review success and improve future decision making. Ultimately these training course materials allow you to develop the decision making skills for participants individually and as a member of a team. 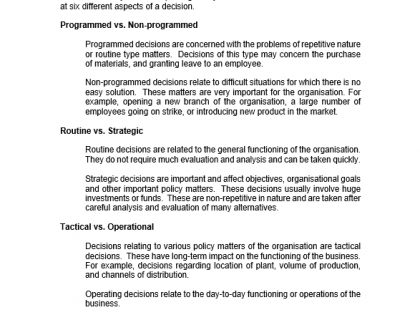 Decision making is regarded as a combination of thought processes that result in the selection of one course of action from several possible alternatives. Some decisions are so routine that you make them without even thinking about it. But difficult or challenging decisions demand more attention, consideration, and a more formalised approach. There are processes, tools, and techniques that can be used to improve your decision making process. 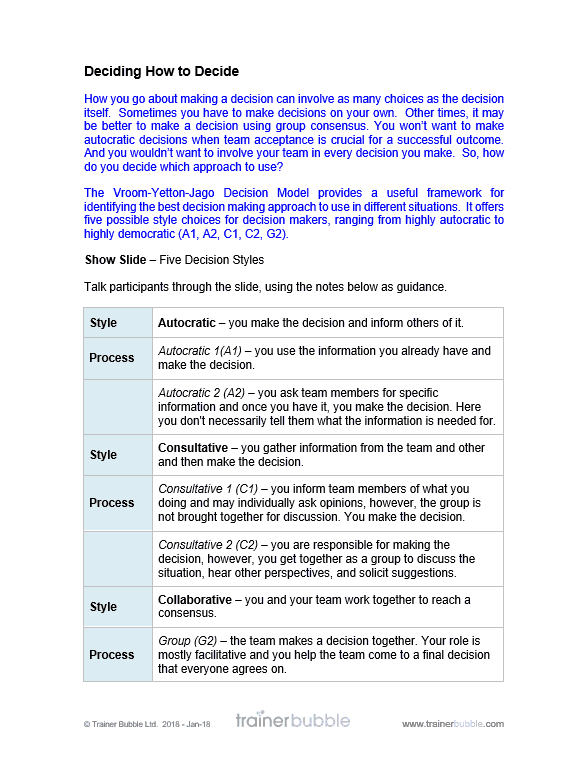 These decision making training course materials will help participants to define decisions, explore alternatives, and give them the skills needed to make decisions competently and confidently. Introduction, Objectives and Expectations – Setting the scene for the training intervention, understanding the needs and wants of the participants and using an activity to better understand the types of decisions participants need to make and get to know each other better. Classifying Decisions – Using different systems to classify the different types of decision we make and prioritising them accordingly. 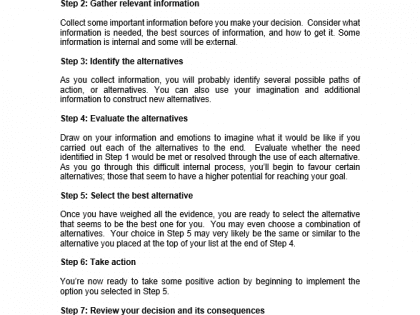 The Decision Making Process – Identifying a decision, and evaluating alternatives before selecting the ‘best’ option. Following a set route to decision making, which can be followed in part or completely, depending on the type of decision to be made. 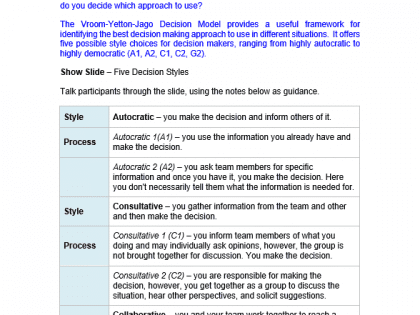 Deciding How to Decide – Exploring the Vroom-Yetton-Jago Decision Model, which provides a useful framework for identifying the best decision making approach to use in different situations. Do you make the decision yourself? Or include others? If involving others, how should you approach the task? Uses a case study to help embed the learning and practice skills. 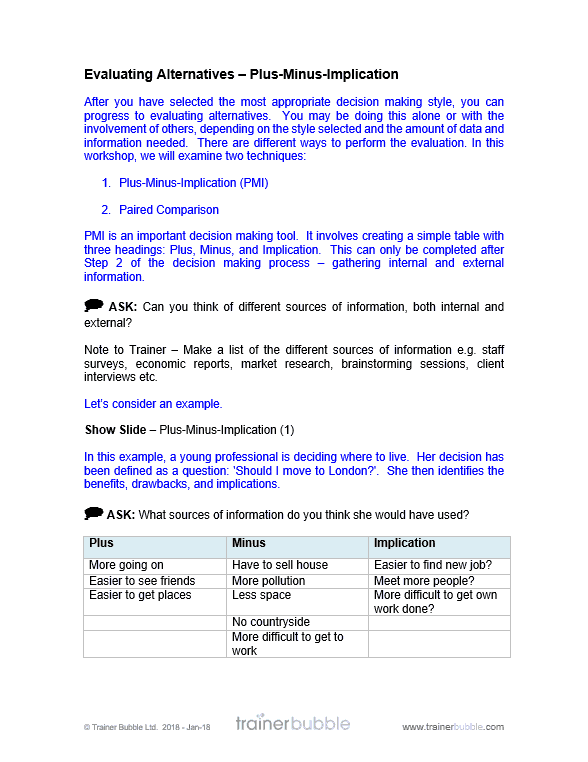 Evaluating Alternatives: Plus-Minus-Implication – Evaluating alternative decisions and establishing which decision is best to take based on key facts and information. PMI is an important decision making tool and this section explores the model and provides an opportunity to practice. Evaluating Alternatives: Paired Comparison – Similar to Plus-Minus-Implication, Paired Comparison Analysis involves working out the relative importance of different options. The tool provides a framework for comparing each option against all others, and helps to show the difference in importance between different factors. Again, this section provides information and an opportunity to practice. 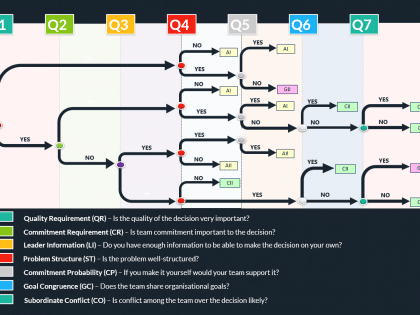 Team Decision Making – Exploring how to make effective decisions as a team, ensuring that the process runs smoothly and decisions and agreements are found in a constructive way. 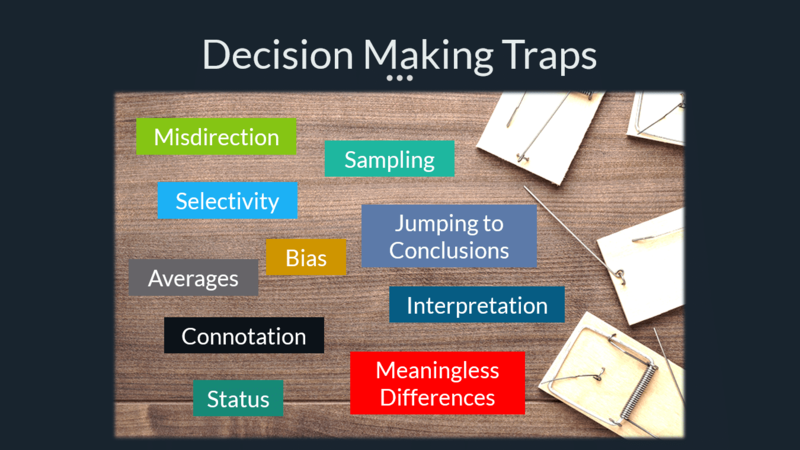 Decision Making Traps – Identifying the common pitfalls to decision making and what can be done to avoid them. Decisions and Outcomes – Establishing the difference between decisions and outcomes and highlighting that a good decision does not always mean a good outcome and vice versa. This section uses popular examples to emphasise the point. 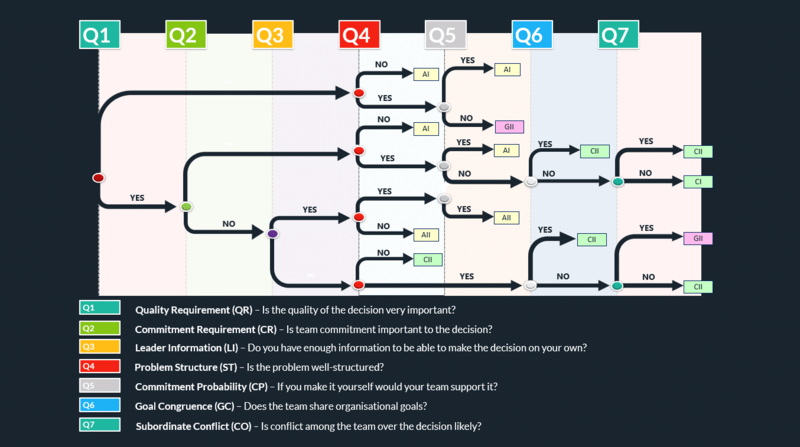 Reviewing Decisions – Considering the results of decision making and the outcomes, and evaluating whether or not it has resolved the need identified at the start of the decision making process.